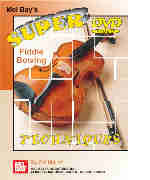 Master fiddler and teacher Ed Marsh introduces the basic bowing patterns used by all professional fiddlers as well as play-along exercises so the student can practice these techniques and patterns. Single bowing, the single and double shuffle, the Georgia shuffle and the OBS shuffle are all taught step by step. A PDF file is available for download at www.melbay.com/DVDBooklets. Download now from PlayBetterBluegrass.com!